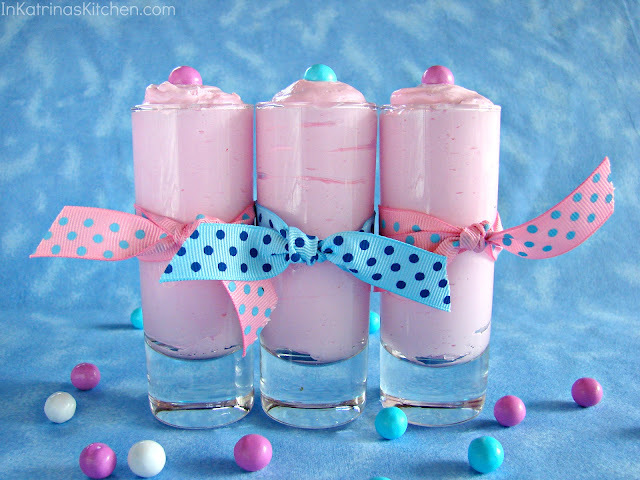 Fluffy mousse dessert flavored with cotton candy syrup, perfect for baby showers, Valentine’s Day, or Mother’s Day. Everyone always asks what Mom wants for breakfast in bed. I’m going to let you in on a little secret: Mom doesn’t want breakfast in bed; she wants brunch. Seriously people, it’s the 21st century…haven’t we been over this? Mom wants to sleep. The end. Okay well THIS mom wants to sleep. Don’t get me wrong- I’m a morning person. I enjoy getting up with the kids. The worst part however is hitting the ground running. I usually wake up to the sound of our toddler crashing things around in his room. Once children realize that you are awake they want to play and read and run and jump and eat NOW. Also this mom wants a little pink in her life. Pink things just taste better don’t you think? If you follow me on Instagram you may have seen a few teasers about this post. I just can’t help myself; pink things are photogenic. 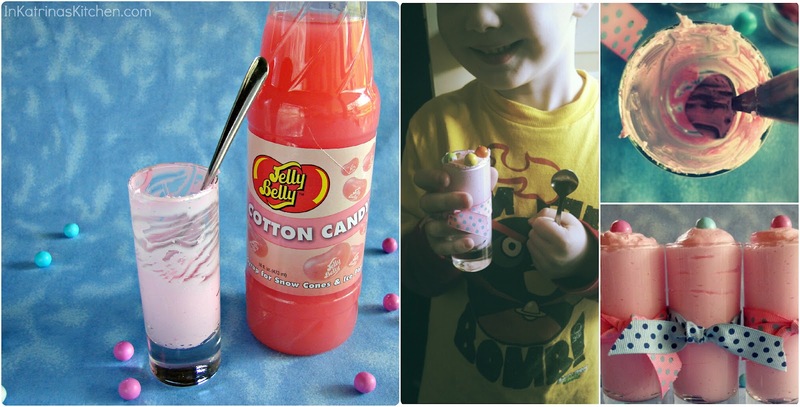 When I saw this Jelly Belly Cotton Candy Syrup I knew immediately that I was going to make something with it: Cotton Candy Mousse! I found mine at Bed Bath and Beyond. You can surely order it online as well. It turns out that even my boys like to eat pink things. They didn’t even mind the polka dot ribbons and tiny spoons. Fluffy mousse dessert flavored with cotton candy syrup, perfect for baby showers, Valentine's Day, or Mother's Day. In the bowl of your mixer combine cream cheese, syrup, and milk until smooth. Slowly beat in powdered sugar. Then fold in the Cool Whip. Spoon into 12 dessert shooter glasses or any small serving dishes. Chill at least 3 hours. Serve cold. I have not tried this recipe with fresh whipped cream so I cannot say what your results would be. If you choose to substitute the Cool Whip for fresh whipped cream I would recommend at least 2 cups of whipped cream. This was Jelly Belly Cotton Candy flavored syrup intended for making homemade snow cones. There are lots of snow cone syrup flavors available in many stores. Feel free to experiment with different flavors! This is so unique and lovely. Awesome idea Katrina!! Seriously, this is too cute – and totally fun looking. These are just perfectly sweet and girly! Oh my word. How cute! Oh my goodness. I can't even focus long enough to read the recipe. I WANT THESE!!! They are gorgeous and sound absolutely PERFECT!! I had no idea cotton candy syrup existed! Now I want to drink it through a curly straw. Pink things always tast better. I have to get my hands on that syrup. This is brilliant! Oh I love cotton candy! This is soooo creative & what gorgeous food styling & photography! Who wouldn't want to eat this?!? Sounds wonderful and they look so cute! I am definitely with you on brunch! These look like a beautiful, pink cloud. Yum! I can't tell you how much I love this, sweet Katrina…pretty and yummy…and uber creative!! oh my, I loved cotton candy as a kid, I haven't had it in many years, now I want to make your mousse, so fun and really creative! So cute! I would so go for sleep on Mother's Day. My kid is 7 and he is still the same way – eat, play…NOW!! Too funny! I saw the top picture on Pinterest and thought they were candles! I thought, 'when did Katrina start making candles?' LOL! Ah, but cotton candy candles would smell delicious – I love the stuff and I think this mousse would definitely be a hit for me on Sunday! Hint, hint, kids! Cotton Candy is the best for me and with this post this is a new style I want to see and try this.. I have never understood the breakfast in bed thing–I want to be sleeping! Also, the potential mess stresses me out, but that's just me. Great idea of something to do with flavored syrup and really cute glasses! This is so brilliant! I need to have some of that syrup in my life this summer. And yes- SLEEP is what we want! For sure! Too stinking fun, Katrina. I love boys but everyone needs a little pink. This is so great! This mom wants to sleep too. And she wants to eat your pretty mousse! The cutest thing I've ever seen!!! It's yummy and it's PINK! YEAH! Your Cotton Candy Mousse is amazing! You are so creative, and your pics are great I'll be looking for other flavors. Those are SO CUTE. I looooove cotton candy anything so I hope I can find these! And this mom? Wants a mimosa first thing on Mother's Day. I don't even need food, just a mimosa. This is so cute. Looks like something Katy Perry would carry around. Suddenly I really want to go to a carnival.. and eat real cotton candy. What a great idea! Yeah that's what all the mom's I know want too…SLEEP!! Haha! Love your honesty about no breakfast in bed, just sleep. I'm not a mom but I can imagine that's too true! These treats are so fun and festive. Love em! 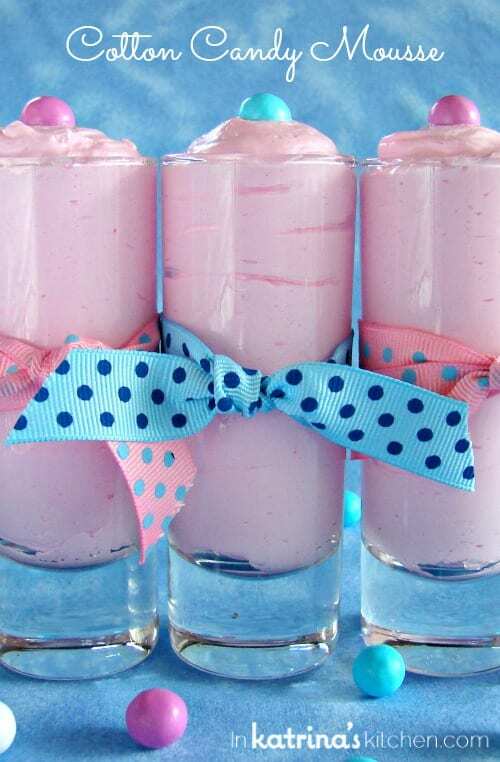 wow these look super cute, I am such a big fan of pink desserts! Do you have tiny spoons to use to eat these? The shooters I have are very small. Yes- the box of shooters I have (Libby is the brand name) came with 8 glasses and 8 tiny spoons. So creative – clearly I need to hunt down that syrup asap! Holy Moly! We should be best friends, I love pink too! I have a whole pinboard on pinterest dedicated to pink! I totally understand the toddler thing! My kids wake up and instantly want breakfast, me, I would love a brunch! I need to get some of this syrup, cotton candy is one of my favorite flavors! Yum! Oh my god I seriously want to swim in a pool of this! This is such a cute idea, Katrina! I can see serving these at a baby shower or little girl's birthday party. I hope you got to sleep on in Mother's Day! I would like to invite you to share this post (and your other posts 🙂 ) on a new photo based recipe sharing site that launched in May. The idea is simple: all recipe photographs are published within minutes of submission. And, of course, the images link back to the author's site. like the shades mixture. really like their colors, wonderful shots!! 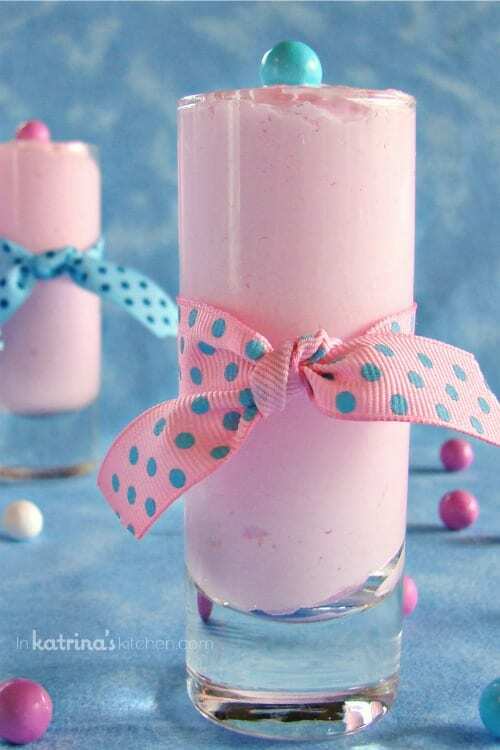 i'm making this for my upcoming baby shower, and i'm wondering if i can prep it a few days early… my family makes a dessert that has a base that starts out very similarly (cream cheese, cool whip) and it starts to get watery after a day or so. it does have fruit in it though, which may be the cause of the excess liquid. any advice would be greatly appreciated! I would say that a day in advance is about all you are going to get out of this before the texture starts to change. I don't think it would be as watery as a fruit-based dessert but it may start to separate some after a day or so. do you think leftovers would freeze well? i kind of want to load these into popsicle molds and have a creamy frozen treat. I have never frozen it- I’m sure it would be fine but I would worry about the unthawing. As long as you plan to eat them popsicle-style I think you should be fine. Let me know! How cute are those! I love the glasses! And we happen to have that cotton candy syrup already. I just might have to make these. Thanks! Twitter and integrate them into your marketing strategy. Website content with substance encourages longer and repeat visits. rankings on search engines, though there are various tools across web that any digital marketers can tell you about. I just made these but they aren’t pink. Should I have added more syrup? Do they turn pink after sitting? WOW! Just saw a recipe today for Cotton Candy Ice Cream, and was thinking that if I bought a bottle of the Cotton Candy syrup and made the ice cream, how would I ever use up the rest of the bottle after making the ice cream; and here’s the answer for what else I could use it to make!! Thank you!